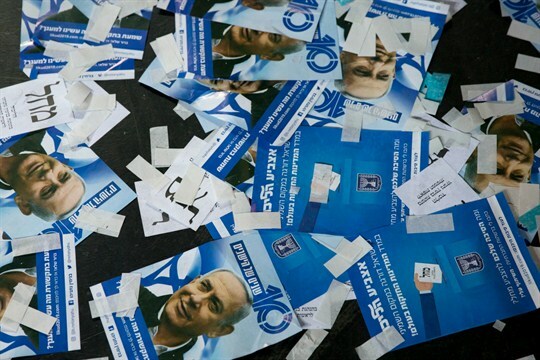 Likud party ballot papers and Israeli Prime Minister Benjamin Netanyahu’s campaign fliers on the ground after polls closed in Tel Aviv, Israel, April 10, 2019 (AP photo by Ariel Schalit). In this week’s editors’ discussion episode of the Trend Lines podcast, WPR’s editor-in-chief Judah Grunstein, managing editor Frederick Deknatel and associate editor Elliot Waldman look at how Benjamin Netanyahu was able to win a historic fifth term as prime minister of Israel in elections that were held there this week. They assess what Netanyahu’s victory means for Israel’s policies in the region and its relationship with the United States. Other international news items this week that caught the editors’ eyes: Brexit’s delay, Bashir’s ouster in Sudan and South Korean President Moon’s visit to the White House.